In yet another decision that violates International Law and the Fourth Geneva Convention, the Higher Construction and Planning Committee of the Israeli ‘Civil Administration Office’ has approved a construction plan to ‘legalize’ two colonial outposts in Ramallah, in addition to building 2200 more units. The Israeli plan includes the approval of a structural map for the Ma’ale Mikhmas illegal colony, built on illegally seized Palestinian lands east of Ramallah. The plan also calls for the construction of 2200 new units, and the ‘legalizing’ two outposts (this would make them legal under Israeli law, but they remain a direct violation of international law). 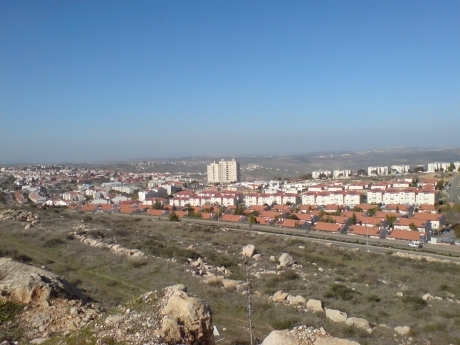 The plan, originally submitted in 2014 and approved by Israeli Defense Minister Moshe Ya’alon last month, would lead to the construction of an additional 800 units in Ma’ale Mikhmas by the year 2030 and 300 units in Kokhav HaShahar. In total, the plan includes the construction of at least 2200 units in Kokhav HaShahar, Ramonim, Ma’ale Mikhmas and Psagot, to be completed by 2030. The plan also includes the construction of new units in Tel Zion, and the area south of Ofra colony, in the northern part of the West Bank. Israeli daily Haaretz said the approval comes ahead of a hearing in the High Court of Justice, scheduled for Wednesday, to look into a petition submitted by Yesh Din Israeli organization, on behalf of Palestinian land owners, calling for the removal of Mitzpeh Danny illegal outpost, built on private Palestinian property. The Palestinian Foreign Ministry denounced the Israeli plans, and considered it part of the comprehensive Israeli escalation, and crimes, against the Palestinian people, in addition to directly violating all related resolutions and agreements. It stated that the timing of the new plan, ahead of the planned meeting between President Barack Obama and Israeli Prime Minister Benjamin Netanyahu places further tensions and obstacles that would further obstruction the conducts of the Quartet Committee (The United States, the European Union, Russia and the United Nations). The Ministry said Israel’s colonies in occupied Palestine are among the issues recently presented to the International Criminal Court. It called on the Quartet Committee and the UN Security Council to require Israel to halt its violations, and abide by international law, in addition to stopping the escalating Israeli crimes and violations against the Palestinian people, and against their lands and holy sites. The Ministry also called on the Security Council to provide the Palestinians, who are living under an illegal and immoral Israel occupation, with the necessary international protection. While the number of Jewish settlers illegally living in the West Bank and Jerusalem by the end of 2013 was 350,000, the current number of settlers is around 54,.000, the Israeli Information Center for Human Rights in the Occupied Territories (B’Tselem) said. It added that Israel established 125 settlements, dubbing them as “communities,” in the West Bank, in the period between 1967 and late 2013. In addition, more than 100 colonial outposts were established without authorization from the Israeli government, yet these outposts received funding and support from government ministries despite their ‘illegal’ status. The Israeli government also directly funded and supported colonial outposts in the heart of Palestinian neighborhoods in occupied East Jerusalem.